Eggless Peanut Butter Cookies is my first challenge which I completed after joining the HBC – Home bakers challenge which is a brain child of Priya of Priyas versatile recipes and this month Viji of virunthu unna vaanga gave 4 awesome recipes to try and this one was the easiest one. Thank you Viji for giving this great recipes. Will be trying the other recipes soon. In a bowl, sift the flour, baking powder, baking soda and keep aside. 3. In another bowl, add the sugar, peanut butter and butter. Beat it, until it becomes fluffy. 4. Add the sifted flour gradually and combine together. 5. It should form a non sticky dough kind of a texture as shown below. 6. Pinch off dough by the tablespoon, and roll into balls and slightly press them. 7. Place 2 inches apart on a parchment lined baking sheets. 8. Using a fork press the balls and make a line pattern and flatten them to a 1/2 inch thickness. 9. Bake the cookies for 18 to 22 min, or until they becomes lightly golden. 10. Cool it and serve it or store it in a air tight container. 1. You can add the crushed peanuts to add more crunchiness. Hi I was looking for eggless peanut butter cookies and end up here . I need a small clarification. It shows 200 gms of butter which is nothing but close to 1 cup or 2 sticks of butter we get here in US . Is that right do we need 1 cup butter for 1.5 cups of flour ? Hi Anuradha Menon, yes you can add flour. Add it little by little to get the correct consistency. Also chk if the sweetness is correct for your family after adding flour. Thanks for trying the recipe. This looks wonderful! So tempting! Perfect & beautiful looking cookies…..I would like to garb all. Lovely cookies and looks bright. Nice clicks. Pictures are very attracting Akila. there cookies are very addictive. isn't it? 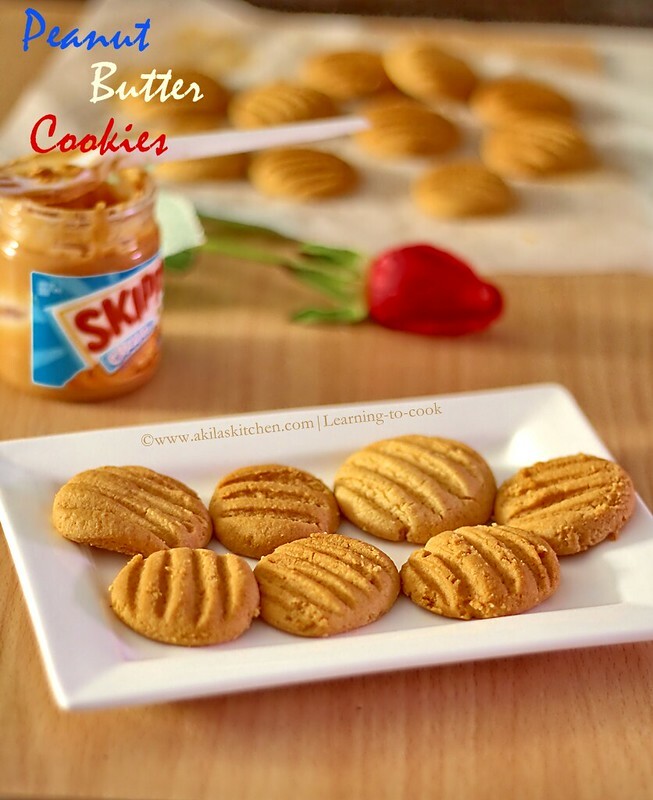 They looks stunning and elegant Akila, feel like grabbing some and munching rite now. 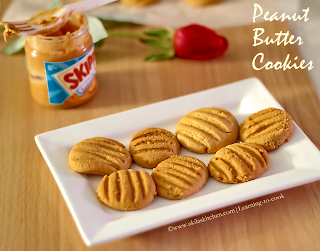 Wow they look super perfect and crunchy, love the clicks and the impressions…. 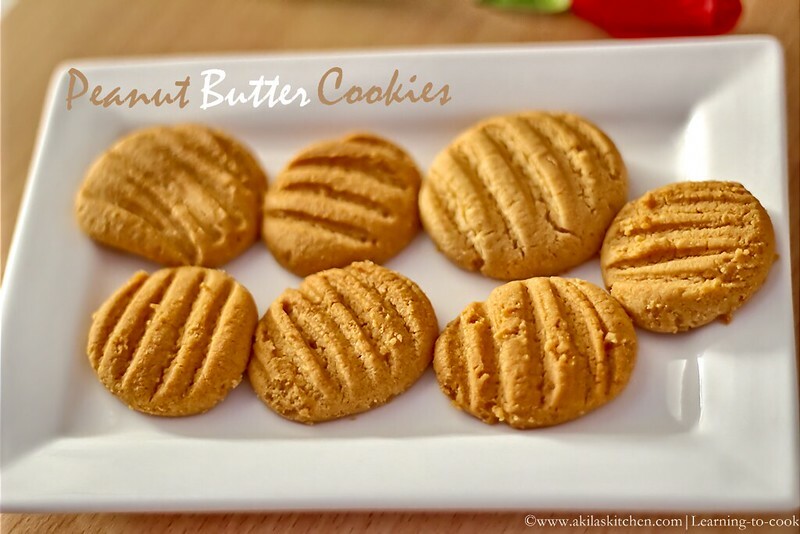 I like these eggless cookies and good us of the peanut butter. Its a stunning outcome and beautifully baked. 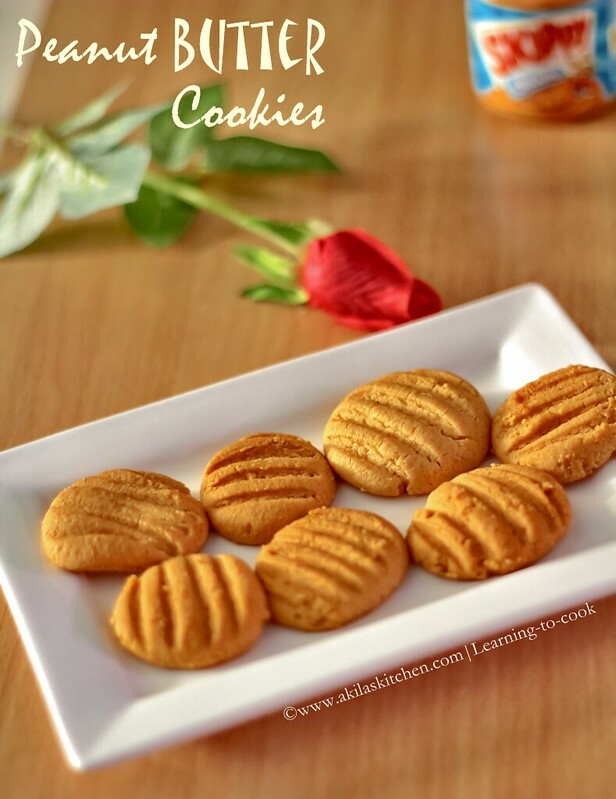 Really yummy cookies, nice clicks too! loved your pic and cookies too.